Outspoken Alan Grayson Gets Another Chance In Congress : It's All Politics The Florida Democrat known for his biting comments targeting Republicans was among the House freshmen sworn in this week. He started serving in Congress four years ago but lost a bid for re-election. Now he's back and shows no signs of softening his tone. 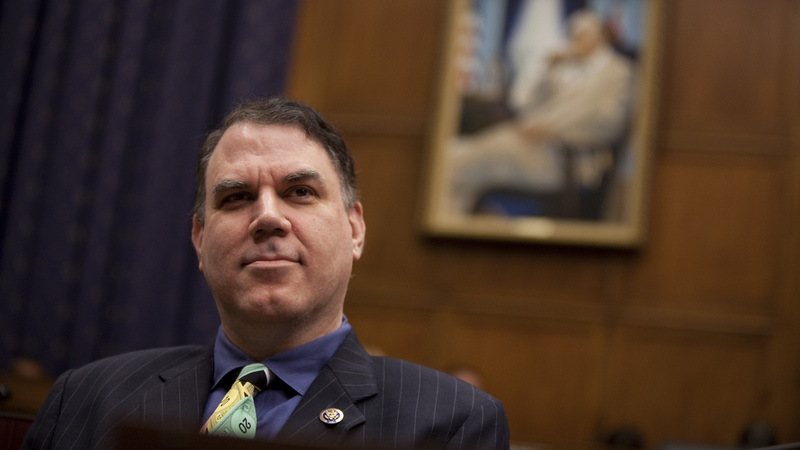 After losing his bid for re-election in 2010, Democrat Alan Grayson of Florida is back in Congress after winning a safer district. Among the more than 80 House freshmen who were sworn in this week, there were several who had been there before — including Florida Democrat Alan Grayson. After starting his first term four years ago, Grayson quickly made a name for himself with biting comments targeting Republicans — like when he said during the health care debate: "If you get sick, America, the Republican health care plan is this: Die quickly." His national stature didn't prevent him from being defeated in 2010. But now Grayson is back. About 50 people — mostly members of the area's large Puerto Rican community — gathered in Orlando recently for a candlelight vigil to draw attention to the gun violence claiming lives in Puerto Rico, Florida and Newtown, Conn.
Grayson, who was among those speaking, said the first step toward stopping violence is overcoming community apathy. "That, in the end, is the only and the only true solution to our problems," he said, then began a chant: "The people united can never be defeated." It's a chant more often heard from labor organizers than from congressmen. Although he was out of Congress for two years, Grayson never really went away. He continued fundraising and working for progressive causes and was a regular guest on MSNBC and other cable channels. In November, he easily won in a newly drawn district that is 40 percent Hispanic. Grayson says his progressive views appeal to his Latino constituents. "They have social needs that generally mean that they ally themselves with progressive forces and, in many cases, represent and embody those progressive forces," he says. "Many of the most liberal members of the incoming Congress right now, the new members of Congress, are Hispanics." Like many Floridians, Grayson is originally from up north — New York. He worked his way through Harvard, earning a law degree and a master's in public policy. Before entering politics, he made millions as the head of a telecommunications company and as an attorney who prosecuted contract fraud cases against defense contractors. Grayson says he has developed a national following because he just says "what others are thinking." Asked, for example, about the prospects for the House to pass gun-control legislation in the new session, he's skeptical. "I think many Republican members of Congress are afraid that if they supported anything resembling reasonable gun control, they would lose the next primary," he says. "And the NRA would see to it they lost the next primary." It's the kind of unvarnished comment that in his first term made Grayson a hero to many liberal Democrats and a villain to many conservative Republicans. In 2008, he won in a traditionally Republican district in the Democratic wave that elected Obama. Two years later, he lost his bid for re-election by a wide margin. David Wasserman, an analyst with Cook Political Report, says in this year's successful election bid, Grayson's campaign seemed to tone down his activist image. "Is there a chance that he's a more civil member over the next two years? I think only time will tell," Wasserman says. "But there are some indications that he's a wiser person for having won and lost before." But Grayson says don't count on him toning down his comments now that he's back in Washington. For example, when asked if he thinks Republicans could successfully appeal to Hispanic voters, he says no. "Because for every Hispanic vote they pick up, they'll lose four or five racist votes," he says. "The Republican Party has been in many respects, with all due respect, the party of racism in this country, going back to the time of Nixon. I don't see that changing anytime soon." Grayson says he sees things in black and white. On bipartisanship, he says Americans shouldn't be fooled into thinking it's a magic wand that can bridge the gap between the two parties. This term, for the first time, Grayson joins the Democratic leadership in the House — winning the job of regional whip. Surely, that calls for him to change his style? "Well, let me put it this way: I know how to handle the whip," he says. But does that mean he'll need to be more moderate in his approach to people? "Is that how you see people who wield whips, as moderates?" he says. "That's interesting. I never really thought of it that way. I'll have to give that some thought." Grayson says the main way in which this term will be different from his first stint in Congress is that he's now in a safe district. He beat his opponent by 25 points — which means he's likely to be there for some time to come.